I’m now back from a trip to the US and thought I would restart blogging with some images from the trip. 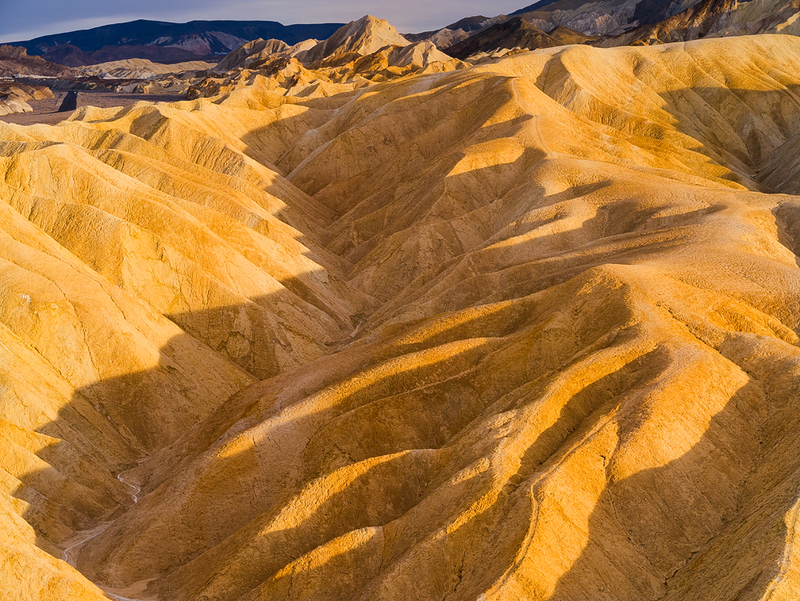 The first area I visited was Death Valley and the photograph shown above was taken at Zabriskie Point in the valley. It’s a bit of an odd place to visit in terms of Landscape Photography as the clear sky tends to limit when and how you shoot. My own preferrence when shooting landscapes at sunset is to have plenty of broken cloud which will colour up with the low sun. Here however the sky is clear much of the time so you don’t get the colourful sky. You can however achieve rather dramatic side lighting as shown on the hills here. In case you are wondering, these hills are just mud and gravel but they are rock solid and painful if you happen to slip on them. The image was captured using my Panasonic GX1 and 14-45mm lens which was tripod mounted. There was plenty of light around so it wasn’t necessary to tripod mount the camera but I didn’t want to take any chances. I also think tripod mounting works well in any light and ensures very sharp images. More photographs will follow once I have had the opportunity to download and sort them.